Don‘t let it‘s size fool you. The FT-45™ is a simple, compact and highly effective crimp tool for installers and techs that terminate RJ-45 connectors regularly. Instead of another traditional oversized, heavy, crimp tool style loaded with features that are rarely used or that just don‘t work well, we took this tool in a new direction. It‘s built for today and tomorrow, not the past. A single crimp cavity for RJ-45 / 8-position connectors that can be used with Feed-Thru, standard, or shielded connectors for CAT5e or CAT6. A custom, heavy duty cutting blade that will last for over 2,000 cuts. A mechanical design that requires only 1/3 to 1/2 the hand force of traditional tools to crimp the connector - no ratchet mechanism is needed and one handed crimping is possible. The tool is compact, 5-1/2“ in length and weighs just over 1/2 lb., about half the size and weight of bulkier traditional tools. 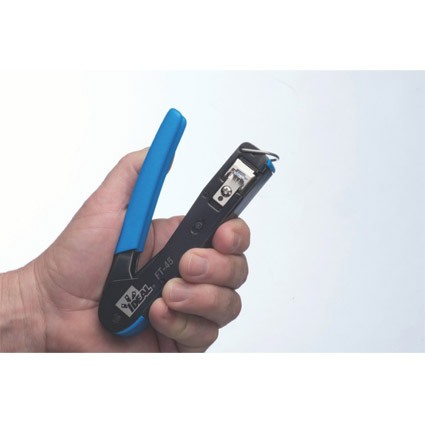 Easily fits in your pocket and lightens the tool bag load. It packs a punch, and does exactly what it‘s supposed to.